Baseball is America’s past time, but Football is its most popular sport. The Super Bowl is one of the most popular sporting events in the country. You can find fans everywhere. Unfortunately, mobile football games aren’t as great as the real deal. There are a few good ones. However, most of them are arcade games or super simple titles. You get the best football gaming experience on console by a long shot. However, those who still want to try it out can check out the best football games for Android here. Franchise Football 2017 is an NFL simulator for CBS. That means it's mostly a freemium cash grab. However, there are some redeeming qualities about the app. It's addictive, fun, and it's not too bad before the freemium elements start creeping in. 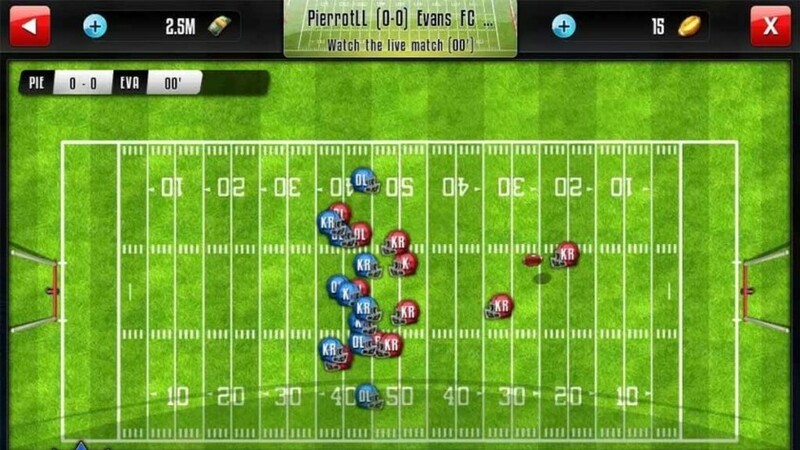 It features a ton of actual NFL players, all of the teams, and simple, hands-off mechanics. It's a great way to kill some time that should last longer than a few hours. It gets tedious eventually, but that could mean a few hours or a few months. It's all about what you like. Fantasy sports is one of the few games that works great on mobile. ESPN Fantasy Sports is one of the most popular fantasy football platforms on the Internet. The app lets you communicate with other managers, trade, set your lineups, browse free agency, and more. It also lets you create leagues, join leagues, and draft your teams. That's basically all the app needs to do. It does have the occasional bug. Thus, we'd occasionally verify that your rosters are set properly on the website if we were you. Otherwise, the app works pretty well. Fanatical Football is an unofficial football game with actual football mechanics. You play as fictional teams, run plays, score touchdowns, and stuff like that. The mechanics are a bit clunky and the graphics are second rate. The game also has some bugs. However, it's still one of the better pure football games on the Play Store. The game also features two play modes, player upgrades, power-ups, and more. It's a freemium game and that's not great. It could be much, much worse, though. Football Dash is an excellent arcade style football game. You basically plow your way through a ton of defenders to score touchdowns. The game features simple, one-handed mechanics along with power ups, Google Play Games leaderboards, and more. It's not much. However, the arcade style makes it great for short play sessions. It's perfect for commercial breaks during a game. Otherwise, there isn't much to it. GameTime Football 2 is is kind of like the NBA Jam of football games. It has an arcade fell with simple mechanics. You also play with a reduced roster size (four players instead of 11), and the rules are a little relaxed. The game also features former and current pro players, player upgrades, tournaments, and more. It's far from a perfect experience. However, it's definitely better than most. The glitches do get a little annoying sometimes, though. Most of the in-app purchases are for player customization things, like uniform colors. Try some other sports games! Madden NFL Football is the official NFL game on mobile. That means its a shameless cash grab game with a freemium price tag made by EA Sports. There are some things that make the game not terrible, though. It does feature actual football mechanics. You line up, call plays, make passes, run around, and do all of that stuff. It also features weekend tournaments, leaderboards, and more. It's not half bad until those freemium elements come creeping in. Even then, it's tolerable as a football game. Marshawn Lynch Pro Football is a bit of a diamond in the rough. It's a pay-once football game from 2018. That's not a common thing. This game supports decent graphics and controls, arcade style game play, and more. There aren't any actual football games in this one. Instead, you go through a bunch of training mini-games. It's still entertaining, though. It's a bit of a shallow game for its price tag. However, most in-depth games are freemium and those cost way more than this. Ted Ginn: Kick Return Football is a surprisingly good mobile football game. Your goal is to return kicks for touchdowns. You guide the player with simple one handed controls. The game also features player upgrades, tournaments, and you get points for getting within field goal range. That means it's not just a pass or fail kind of thing. It's simple, but satisfying. There are freemium elements, but they don't pervade every little corner of the game like most others. It's really not bad. Touchdown Manager is a fairly competent football sim. It's not officially licensed. That means all of the players, teams, etc are fictional. The game lets you construct teams, train players with a fairly decent training system, devise strategies, and win championships. We highly recommend you set your own training regimens. Auto training isn't great in this game. Otherwise, it's pretty decent for football fans. We would've liked to see a game like this with NFL players. However, we'll take what we can get in this genre. Yahoo is ESPN's biggest competitor in the fantasy sports scene. Yahoo's app does a lot of the same stuff as ESPN's app. That means you can create and join leagues, conduct drafts, set your rosters, browse free agency, make trades, and chat with other managers. We found that Yahoo's app is a little more stable than ESPN's, but not by much. We would still recommend checking your rosters on a computer occasionally for accuracy's sake. Yahoo and ESPN are the best free fantasy football options. Those who don't mind spending a few bucks can try out FanDuel and Draft Kings. They're not great, but they are different. If we missed any great football games, tell us about them in the comments. You can also click here to check out our latest Android app and game lists!